Help a Shadowscale destroy a dangerous new group of assassins. What is going on inside the Cradle of Shadows? An Argonian Shadowscale named Tsatva-Lan went missing while investigating the lair of a rival group of assassins known as the Silken Ring. His former student, Hides-the-Ashes, asked me to help her track down her mentor and rescue him. Talk to Hides-the-Ashes inside Cradle of Shadows to receive the quest or take the quest via Collections tab. I must explore the ruins to find Tsatva-Lan, and his second-scale, Geel-Ma. My progress is blocked by two locked gates. I must find a way to progress deeper into the Cradle of Shadows. I discovered a shadowy cave network full of Mephala's servants and horrifying beasts. I must fight my way through the darkness to find the exit. I discovered a switch. I should pull it to open one of the blocked gates. Switching the lever opened the North Gate. I should explore that wing of the Cradle. A massive spider has descended from the shadows to block my progress. I must kill this (?). I discovered a second switch. It might help me gain access to the rest of the Cradle's ruins. I unlocked the remaining gate, and witnessed Tsatva-Lan's treachery. 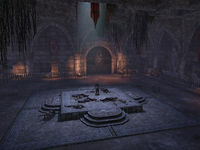 I should regroup with Hides-the-Ashes in the Central Chamber to discuss our next move. I must kill Velidreth's top assassin, Dranos Velador. I must find the lair of Velidreth, the Lady of Lace. I found Velidreth's Lair. I must slay her to end the threat of the Silken Ring and discover the fate of Hides-the-Ashes's traitorous mentor, Tsatva-Lan. Finishes quest Velidreth is dead, but Tsatva-Lan has not answered for what he has done. I should speak to Hides-the-Ashes about what she intends to do with him. This page was last modified on 19 March 2018, at 21:00.